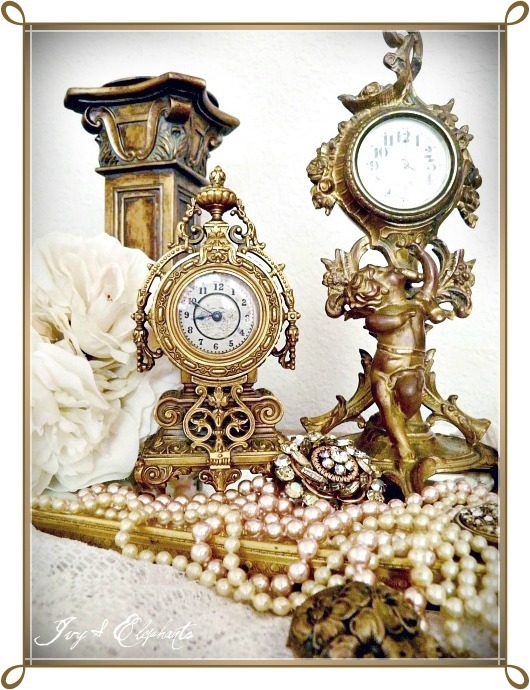 Gorgeous clock collection!! I love everyone of them. I love the figural ones, but I think my favorite is actually the blown glass. 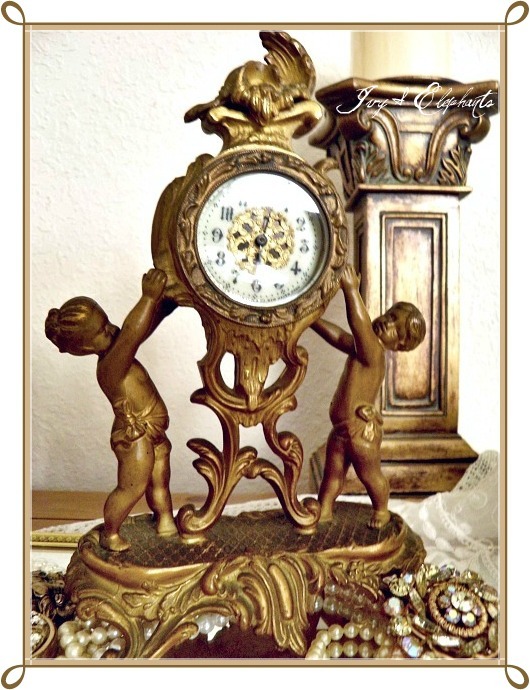 These clocks are just beautiful!! They truly make a stunning display! I could never pick a favorite from this grouping...they're all fabulous!! 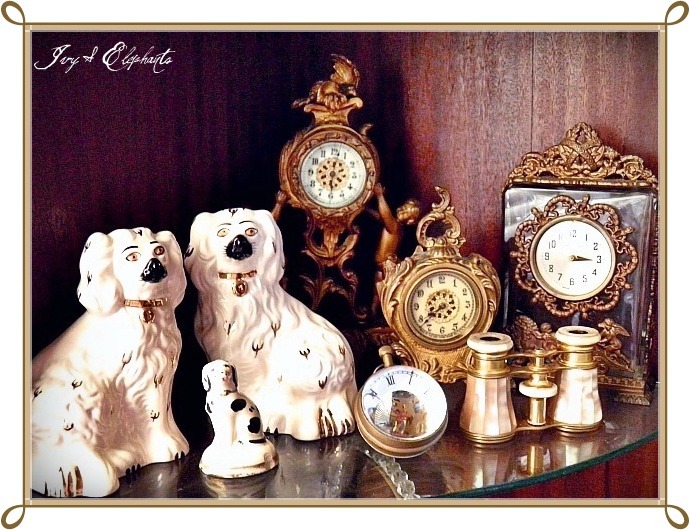 Your collection of clocks is just beautiful! It's a good thing I don't know where you live, or I might have to consider taking up a life of crime! (thus the name of my business and blog), so not only does your beautiful collection make me ga-ga, so does your photography of them! Hope you'll link up to Knick of Time Tuesday again this week! Wow, what a beautiful collection. I remember my mom having one like the first picture. As usual your collections are stunning. 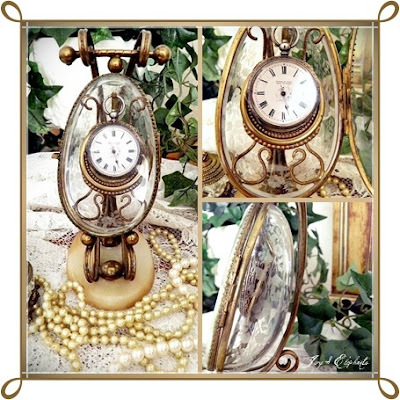 Patti, your clocks are just exquisite! I love every one of them but the one with the little cherub looking back over his shoulder is my favorite. I have very few clocks around, mainly I don't like the stress of keeping track of time, but maybe the solution is not to wind them! Thanks for sharing your lovely clocks. Tick Tock, Tick Tock, I love the anniversary clock! You have a beautiful collection. Hi Patti, I do have a clock collection too your not along, and OMG your collection is absolutely gorgeous! It's hard to pick, but I think the first one is my favorite. Patti I wanted to thank you for stopping by and for your prayers and sweet comments about my little dog Abbie, it meant so much to me. Patti your post has turned me into a slavering salivating drooling mess! Lol!! Yowser them's some durn pretty french clocks!! 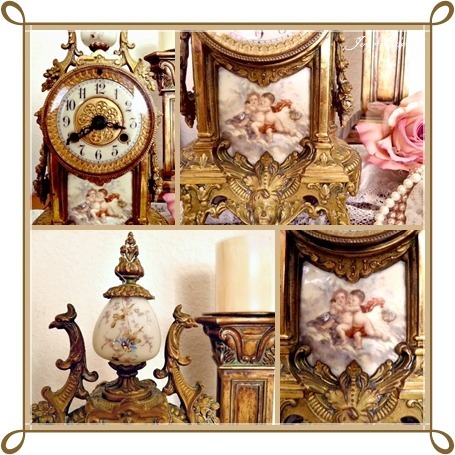 I have a candlestick and inkwell featuring the exact cherub you have in pictures 5 and 6...Great minds girl! *winks* And I'm GREENNN with envy over that fabulous bronze ormolu/marble watch case! Killer find my friend. 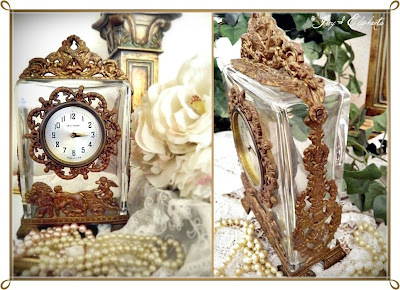 These clocks are fantastic...so beautiful!!! Time is definitely on your side! :) I'm a Rolling Stones fan! :) Oh, you have the prettiest clocks. Just beautiful clocks! Thanks for visiting me, you inspire me to blog more. I also have a facebook I just started, Cheryl's Fascinaging Finds, come visit there also, I'll be back! I would be thrilled just to have one of these...the whole collection, what a treasure! Hello Patti ! mmm beautiful collection you have, I especially like the first one and the blown glass with gilt is so nice oh and the etched glass holder is tooooo nice ! Lovely post ! 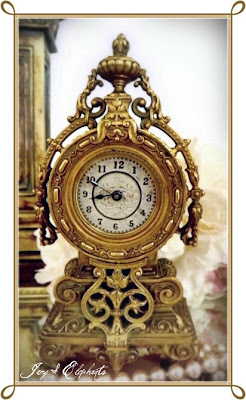 I have a thing for clocks, too, Patti! I have one in every single room now! I've tried to figure out why I like them so much and wonder if it is because I am always conscious of being on time to events or appointments. I love the watch holder. 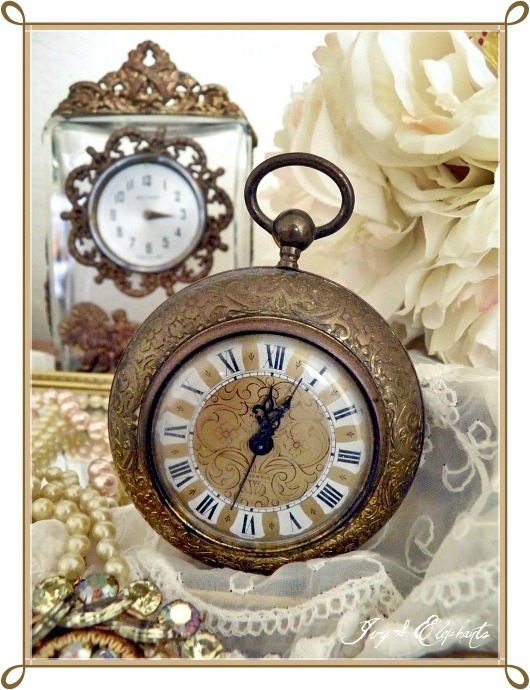 What a great idea to showcase a loved pocket watch. So many of us love clocks! You have a wonderful collection. Really works of art! Oh My... I love them all! What a collection. I've noticed that it is becoming quite rare to find clocks in private or public spaces these days. It is strange, because most people seem to find that there isn't enough time to do everything we want to do with our lives. So, perhaps, today, we see time as our enemy rather than our friend and no longer feel the need, or even want to be reminded of time ticking by. Like you, I admire the wondrous beauty of the clock and clock case makers art. Your collection is just gorgeous and interestingly enough, you admire them as objects and whether or not they keep time is of secondary importance. I always learn something new here, often swoon at your belongings and am forever wondering how you find the space to display all this stuff so beautifully. Is there a shop and two households full? You have a beautiful collection. I love them all! 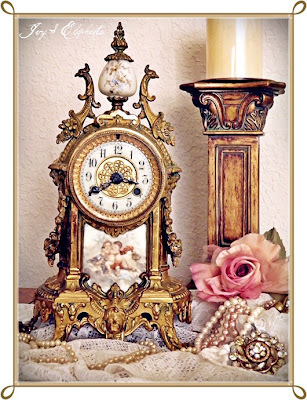 I don't have a lot of pretty clocks, and I wish that I did. Such a beautiful collection you have. 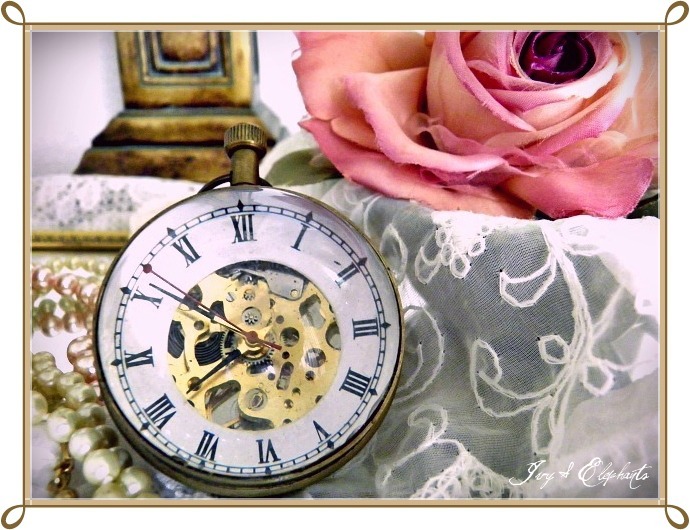 yes, I love clocks too! I have many around the house. I have several large ones that hang on the wall too. Yours are very pretty and regal looking. They look like they could be in a formal parlour. What a Collection you have there! Just wonderful to see someone who shares my love for them too. Hi Patti, What a beautiful clock collection! I especially love the egg shaped glass case. Every single one is amazing. Thanks for linking to the open House Party. Well WOW! Those are gorgeous! I especially love the glass ones and the way they look together with the gilt....such beauty! What a great post! I always love coming over here and seeing what y'all are sharing! And many thanks for joining me again this week for Pearls and Lace Thursday! I notice the pearls make the clocks just that much more elegant!!! That is a beautiful collection, I've never seen so many pretty clocks in one place. Thanks for leaving me such a lovely comment, its very much appreciated. Wow, your collection is gorgeous! New Haven is in my state. We also had a Waterbury clock factory. I collect the little alarm clocks. Not as decorative as your collection but pretty non the less. Thanks for sharing them with us:) Have a great weekend. 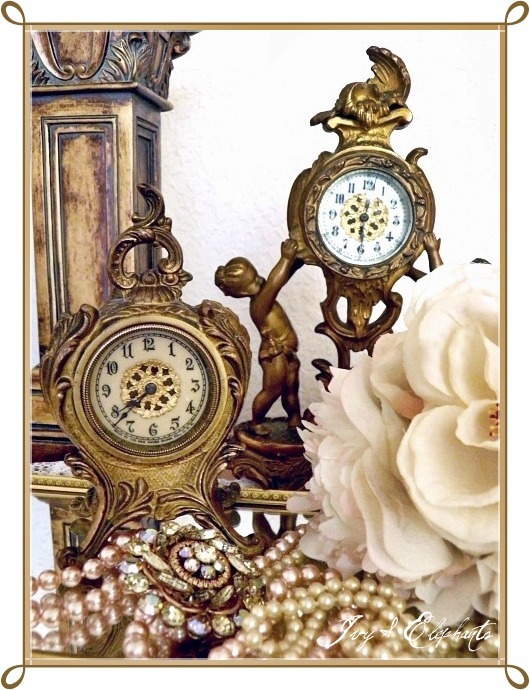 Not only are the clocks gorgeous, but the way you display them as well!!! Beautiful!! I love all your beautiful clocks. I have a few, my husband likes pocket watches, and I have a couple of clocks.....stored. The ticking used to drive my daughter crazy, so we stopped using them....but she is gone from home living on her own now and I need to bring them back out. I think I will do that today! Great inspiration here today. Happy VTT! One thing is far sure, you have a collection of the finer things in life. That is such a beautiful collection! Ok Patti, I don't have a fettish but your giving me ideas...that's all I need to add to my collecting of things! Let me tell you my dear, they are gorgeous! I love them all, very difficult to pick one from this great group. I also love the dog as I do collect dogs. Very cool clocks! Thanks for stopping by my blog. Absolutely gorgeous clocks!! I really enjoyed seeing them all. Wow, those are so amazingly beautiful, I just found you on Vintage Thingie Thursday and I am so glad I did! Now following! I just love this piece! You have so many lovely clocks. Im spending Thanksgiving with some good friends that coincidentally love clocks and restore them. I think a clock club is in order dont you? Time for me to tell you...I love your clocks! Beautiful clocks!!! What a nice collection to have! Your continue to amaze, ladies! This clock collection is gorgeous. Stunning! Thank you for sharing your fabulous collection at Potpourri Friday! Those clocks are wonderful. The blown glass one is my favorite, and so unique and pretty. Yes, I know what you mean...I have the same interest in clocks as you do. And my daughter asked for a clock necklace this year for Christmas. When my dad passed away, I was given his antique pocket watch, but the outer cover broke off, so I gave it away. I loved this post and all of your beautiful clocks. Now I want to get one! You have such remarkable taste! Each clock seemed prettier than the one before! Thanks for visiting and leaving such a sweet comment. That is an amazing collection! And the bottle one,made me gasp! Thanks for sharing! The ball clock is my favourite. I have a tiny one from Ebay that I wear as a pendant (Cost me a penny) but I'm hoping one day to find a bigger one. Your clock collection is amazing. The big French ormolu clock is a stunner! Oh how completely beautiful!! I want to wish you a Happy Thanksgiving!!! Thank you for stopping by my blog. I'm a new follower now,hope you'll join me as well. Beautiful clock collection and what a treasure! Thanks so much for sharing it. I've never seen some like yours, but always love clocks of any kind. Happy Thanksgiving to you! Patti these are all absolutely stunning timepieces! So unique and very special! I have been recovering from hip replacement am doing rehab, and getting better every day! These are so lovely...I'm going to have to go back for a third look....and thank you for your lovely comment! So nice to meet you Patti... I am honored that you would like to follow along with me.. Thank you so much for your visit and most kind words... You have made my day! I just love you blog. It is very welcoming, and I love antything vintage and victorian.. This is an exquisite collection you have here. Hi Patti, I'm loving this post. WOW they are gorgeous, beautiful collections. I love clocks too. 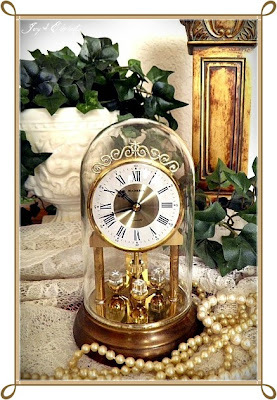 I have a beautiful grandfather clock in my parlor that I love. The chimes are heavenly. 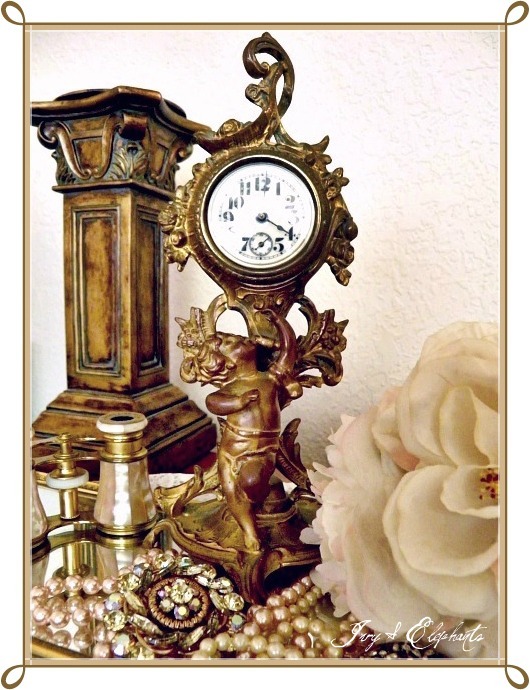 I was also given an antique clock by my father when I was a young girl. My parents furnished our 1800's farmhouse with gorgeous antiques, so I learned early on to appreciate such beautiful treasures. 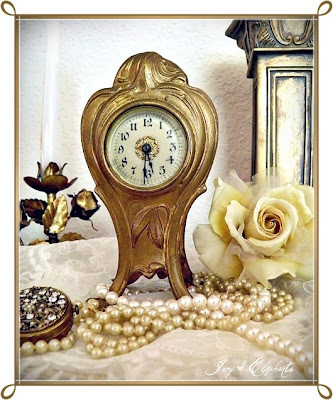 Now I live in a Victorian (from the 1800's as well) and I am always on the lookout for a decorative mantel clock, appropriate for the period and decor of this home. Patti .. thank you so much for visiting and reading the back posts on Once Upon A Time. Your comment really touched me... You said exactly what I hope people get from me sharing my detour and journey.. God is with us ..even when things make no sense; I truly believe I am here not only due to the prayers my friends and family had organized around the world .. but because God has a greater purpose for me. Now, these clocks are brilliant .. Time really is a gift! and to be reminded through such beautiful crafted pieces is priceless. I've always wanted to have a Dutch wall clock from Friesland. I love the old fashioned anniversary clock - it's a classic! What a lovely collection of clocks. I so enjoyed reading the history. Hope you all have a great week! You have some of the most eclectric collections I have ever seen. but I always like the deets you share. I love all the clocks. Wishing you a Happy Thanksgiving. Thanks so much for sharing over at Sunday's Best. What a beautiful post! Now I gotta go figure out what an Anniversary Clock is! :) Thanks so much for linking up---hope to see you back this weekend! Lovely post! I love clocks too but don't have such an extensive collection. Visiting from 2805 Potpourri Party. Now that is a lot of clocks. While I don't have a clock fetish, the marriage counselor my husband and I are seeing has a ton of hour glasses all over his office. I think you are the second person I've ever seen that gravitates toward those types of items. I think it's awesome! New follower!